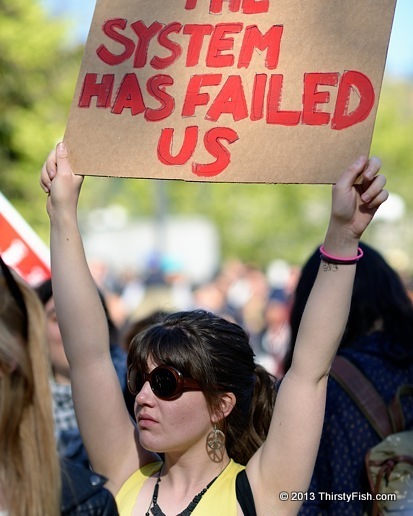 Occupy May Day 2013: The System Has Failed Us! "The system has failed us". That's how many youth around the world feel. In the United States, 1.3 million 16- to 24-year-olds have been unemployed for six months or more. In Spain, youth unemployment hit 57 percent. In Greece, it's over 60 percent. In the U.S., during the last 11 years, college tuition has increased well above inflation rates, and in 2012, the average student loan balance was $24,301. Youth debt, unemployment and underemployment is a sign of things to come. No wonder many feel that the system has failed them. Corporations are harvesting the nation. Serfdom now begins before one gets his or her first job. Most of us are working harder but getting poorer. Some claim that debt slavery is a conspiracy theory, but just ask the Spaniards or the Greeks. There is something wrong with the current system and where it's heading. Any system founded on greed is self-defeating. But unfortunately, only when the system crashes, will most of us understand that "the system has failed us".